VCC Cliffcare has finally received an “official” email statement from Simon Talbot, COO of Parks Victoria. The full statement is at the bottom of this page. This statement largely mirrors several anonymous Parks Victoria emails send to organisations and recreational climbers in the last week. We will break it down paragraph by paragraph… ALL Emphasis (bold text) has been added. 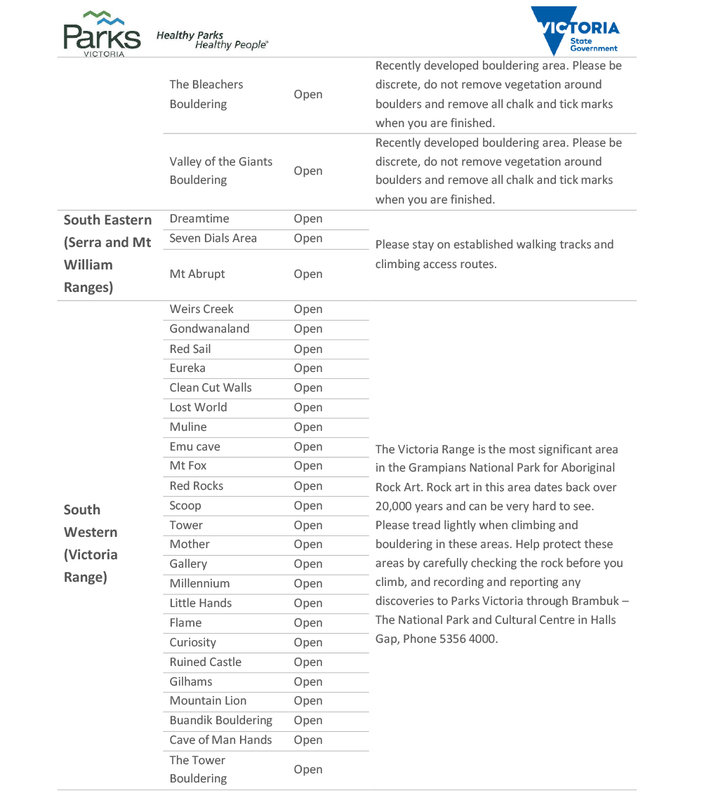 The Grampians National Park Management Plan outlines the Special Protected Areas that have been in place since 2003 where rock climbing is prohibited and hiking and picnicking is permitted. It seems pretty clear off the bat that rockclimbing is prohibited in SPA areas and that is what he wants to tell climbers. Many climbers have been reading these statements with rose-tinted glasses, in an attempt to justify continuing to climb in the prohibited SPA areas. The refusal by Parks Victoria, Cliffcare and even Vertical Life to just come out and say “Climbing is prohibited in SPA areas. Do not climb there.” can be confusing, but is explained below. The recent maps released also include an additional 29 protected areas making up 1.2 per cent of the National Park. Protected Areas are assigned due to their cultural significance or flora and fauna values. This is an incredibly misleading statement that to the untrained eye reads like SPA areas are only 1.2 per cent of the National Park. This is not what he is saying. He is saying they have added 1.2 per cent of new SPA areas to the already created 32% SPA areas in the 2003 Management Plan. 33% of the Park is now SPA, and these areas include half the bouldering and sport climbing (totaling more than 3,000 climbs). The increase in activity and changes in climbing techniques have impacted irreplaceable cultural and environmental assets to a level where enforcement is necessary to preserve these special areas. It should be noted that climbing has not suddenly arrived in the Grampians in the last few years. The first bolts arrived in the 1960s, the first full sport routes were established in the late 1980s, and crags in the 8 key locations were all established in the early to mid 1990s with very little new bolting since then. We have certainly seen new crags and bouldering continue to be added over the last few decades but it has been more of a slow trickle than a sudden explosion in the last few years. What we have seen is a lot more climbers and boulderers in general. Climbers would be in denial if they can’t see the considerable impact we have on these areas, and Parks Victoria stepping up to take care of these areas is overdue, if a little overdone to say the least. Yet the majority of climbing in SPA areas is NOT effected by these issues. Parks Victoria is currently undertaking enforcement activities to prevent rock climbing at eight key locations where signage is installed. Parks Victoria has a legislative obligation to protect these special values. At all times, we ask for your support in leaving no trace, using clean climbing techniques and encouraging your peers to do the same. Signage has also been sighted at areas away from the 8 key sites (The Tower for example), suggesting some rangers are taking it upon themselves to expand the number of key locations identified by Parks. In broader Special Protected Areas, outside those eight key locations, Parks Victoria is sharing the information materials on rock climbing and undertaking enforcement activity relating to other activities not permitted in any National Park including cutting or damaging vegetation (for instance to make or enhance tracks), lighting fires outside of designated fireplaces, depositing litter, interfering with Aboriginal cultural heritage such as rock art or any damage to rock faces such as drilling holes. We are not enforcing no rock climbing activity in broader Special Protected Areas at this stage and will communicate if anything changes (Emphasis Added). Parks official statement in 2016 (has now been removed from the PV website). That last line is the clincher that everyone seems to be celebrating as a win – it’s amazing what a bit of bold text can accomplish. In fact this whole paragraph, seems to mirror Parks position since 2003, in which climbing is “prohibited” on paper; but not enforced. Until 2019, climbing (responsibly) in SPA areas was a known and encouraged activity – indeed there is a great example of Parks / Climbing co-operation / communication in an official statement in 2016. (Click image for full version). A lot of people are calling for ‘plain English’ and to make the situation clear for climbers. If the only way to make the situation abundantly clear to climbers is for enforcement to be expanded into SPA areas, then that creates a huge headache for Parks, and significant worry, not to mention financial cost to climbers. Yet they could decide to hand out fines tomorrow without any changes to legislation – do we push them on this issue? It is ‘possible’ that this grey area created by the language of Parks Victoria is being offered as an olive branch, where not much has actually changed from 2003, except for enforcement of 8 key areas. This would probably be fine if only the rangers on the ground would interpret as we are trying to! They are obviously not, and absent some kind of ‘off-the-record’ instruction from head rangers or PV boss’s, rangers are free to enforce the rules as they see fit. The Grampians Access Working Group / Cliffcare ARE working on the ground to resolve this. It is hoped (no guarantees) that by communicating directly, and doing actual site visits with Indigenous owners and Parks Vic staff, actual concerns at crags can be addressed and blanket bans re-assessed – the so-called ‘fined grained’ approach. There is also rumored to be significant changes in the management of Grampians (with more input from Traditional Owners) in the coming months, so NOT MUCH is going to change until then, and Parks are unlikely to change their official position. So can you climb in an SPA area? According to Parks.. NO. But read or re-read points 1-4 above, and Simon’s letter below and make up your own mind. You could of course, just avoid them for a while, while this mess gets sorted out. What if you’re not sure? If a Crag is near the edge of an SPA area (and there are plenty of them), or you weren’t aware of it’s specific location… Don’t worry about it! Keep climbing responsibly unless you are asked to leave. Maps (some a bit rough) have been created to help identify crags within SPA areas. Remember to sign the online petition, keep writing those letters, donate to VCC Cliffcare and treat the Grampians / Gariwerd cultural and environmental assets with love. NB: While this email from Parks is not a “media release” it’s as close it gets to one, when an actual media release is not there. Can you please clarify why you’re asking climbers to avoid climbing in SPA’s in general when Simons letter has made it pretty clear they’re only enforcing the ban at the original 8 sites listed on the map? Simons words seem pretty clear to me. That wasn’t entirely our intention… it was to clarify what the official position was, and why there might be this crazy grey area. Simon’s letter was indeed clear that enforcement was only occurring in the 8 sites; but that does not mean that climbing in other SPA’s is “allowed”. However to take into account this feedback, we’ve actually changed the ‘Can you climbing in the SPAs’? question above to re-include this ambiguity!